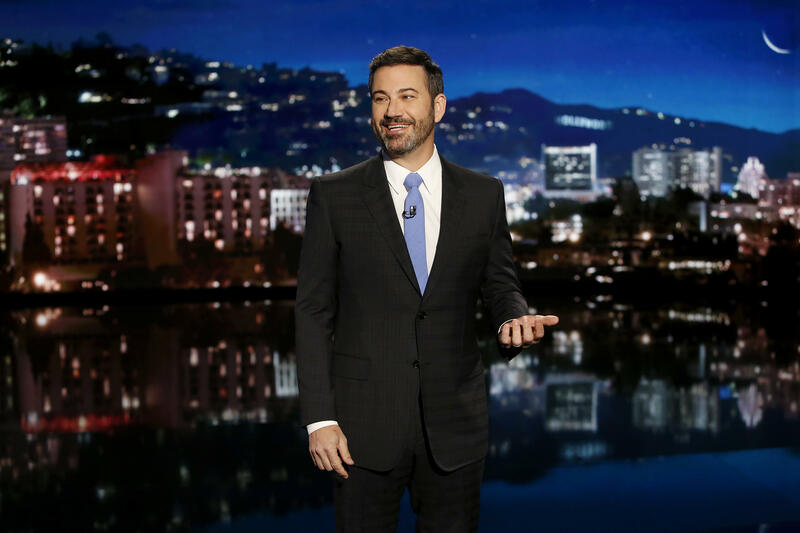 LOS ANGELES -- Late-night comics decried the Las Vegas mass shooting as a confounding and repetitive American tragedy, with Jimmy Kimmel and Trevor Noah lashing out at politicians who oppose gun control. "Or maybe a better question — why do we continue to let them allow it to happen?" said an emotional Kimmel, who noted that Las Vegas was his hometown. Kimmel said, "I want this to be a comedy show. I hate talking about stuff like this. I just want to laugh about things every night, but that — it seems to becoming increasingly difficult lately. It feels like someone has opened a window into hell. And what I'm talking about tonight isn't about gun control, it's about common sense. Common sense says no good will ever come from allowing a person to have weapons that can take down 527 Americans at a concert. Common sense says you don't let those who suffer from mental illness buy guns." "Just to give you an idea of how far away America is from actual gun control, this week Congress is going to vote on deregulating gun silencers. Because I guess Congress is thinking gun violence is out of control: 'How can we make it quieter?"' Noah remarked. Stephen Colbert, who regularly targets President Trump, took a different approach Monday. Agreeing with Mr. Trump's labeling of the Las Vegas shooting as an act of "pure evil," Colbert added, "So then, what are we willing to do to combat pure evil? The answer can't be nothing." The CBS host challenged Mr. Trump to go his own way on gun control without heeding his political party's stance. On TBS, Conan O'Brien said that when he started in late-night more than two decades ago, it was "practically unheard of" for hosts to need to address a mass shooting. But things have changed, he said, a point that was driven home when his head writer presented O'Brien's previous remarks on other recent mass shootings to consider for Monday's remarks on Las Vegas.